What is Operation Christmas Cheer and why should you care? Let’s do a mental exercise. I want you to pretend you are a child again during Christmas time. But instead of the memories you may personally hold of the magic this time of year can hold, I want you to imagine that you are living in a shelter, a motel or a car. Imagine that seeing or hearing things a child shouldn’t see or hear may be a part of your normal life. Maybe your family struggles with addiction, abuse, hunger or maybe one of your parents are incarcerated. All the kids at school are so excited and making lists to Santa but you learned long ago that Santa didn’t exist because there have been years where he never came. Imagine and empty belly and clothes too small. You had to grow up too fast. Now imagine you wake up Christmas morning. No tree or presents and you may not know where your next meal will come from or where you will sleep that night. You look out the window or the motel or car and what do you see? Wait….what is that? Why are all those cars following each other? Why are they driving towards you? There’s a reindeer strapped to the front car and the others are decorated and wait…who’s driving that last car? It can’t be!…it’s Santa!!! How did that make you feel? For many kids in the Middle TN area that is a reality. Our volunteers give up their Christmas morning each year to form a large caravan and surprise hundreds of children on Christmas morning! Each vehicle is filled with either toys, clothes, food, toiletries and more. When we surprise the children they get to go to each vehicle and pick out what they want and visit with Santa! Last year we even had a motorcycle group called Tha Family join us. The kids loved sitting on the bikes and meeting the riders! Besides all the presents and “stuff” we use it as an opportunity to pray with everyone and show Love in a unique way. We also have an opportunity to restore some magic back into their childhood if just for a moment. We will have several toy drives and we will need your help to make this happen! 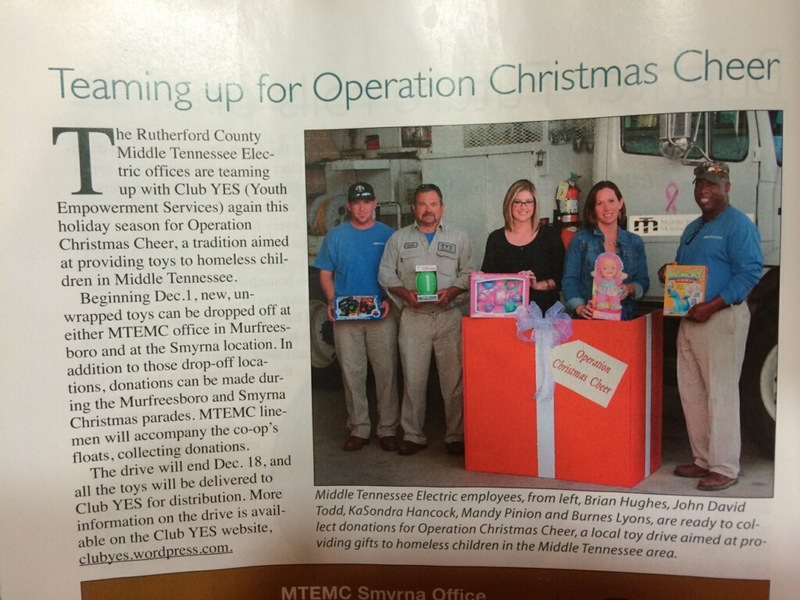 We are excited to announce that the Middle Tennessee Electric Department is hosting a toy drive along with Tha Family Motorcycle Club and Murfreesboro Moms Group as well! Check back for updates on toy drop off locations! Along with toys we need food easy to prepare with use of a microwave at the most, blankets, crafts and toiletries! In addition to Operation Christmas Cheer, we will be contacted by schools addition and social workers about kids not adopted by other programs. It’s our goal to spread the Gospel through self sacrificing love and giving. If you’d like to make a monetary donation please click on the donate link on this site. If you’d like to do a toy or food drive for us please let us know! Wow! For those of you who know us….WOW! What a journey we have all been on these past three years and for those who are just learning about us then I am so happy you are here. There is not doubt in my mind that you have been searching and that is why God led you to this specific page at this specific time. If there is one thing we have all learned to trust in, it is Gods perfect timing. We see it all the time being in a ministry like this! Club YES (youth empowerment services) is a mobile ministry for homeless and in need youth all over Middle Tennessee. We started two years ago around this time (Thanksgiving) when I was running another community outreach called The Cupcake Crew. We worked with schools and organizations to organize community service projects for kids in order give back to local heroes. Right after Thanksgiving I received an email that will FOREVER change my life. It was from the ESP (extended school program) Director. We had worked with that school many times before but this time she was asking for very specific help. I was so naive at the time but that particular school had almost 50 homeless students. She asked for help because when they casually asked them what they wanted for Christmas, the children gave them answers they were not expecting! One boy asked for someone to eat lunch with him, one boy wanted someone to throw the ball with, two sisters wanted their nails painted. In reality they didn’t want “stuff”. They wanted love and time with someone. THIS BROKE MY HEART! We received the email on a Friday afternoon and I cried all weekend. With the power of Facebook we have 50 plus people eager to help by Monday. We didnt know exactly what we would do but we knew we had to do something! Well now we are two years into this mission and we seem to change and grow and do whatever is needed at anytime. 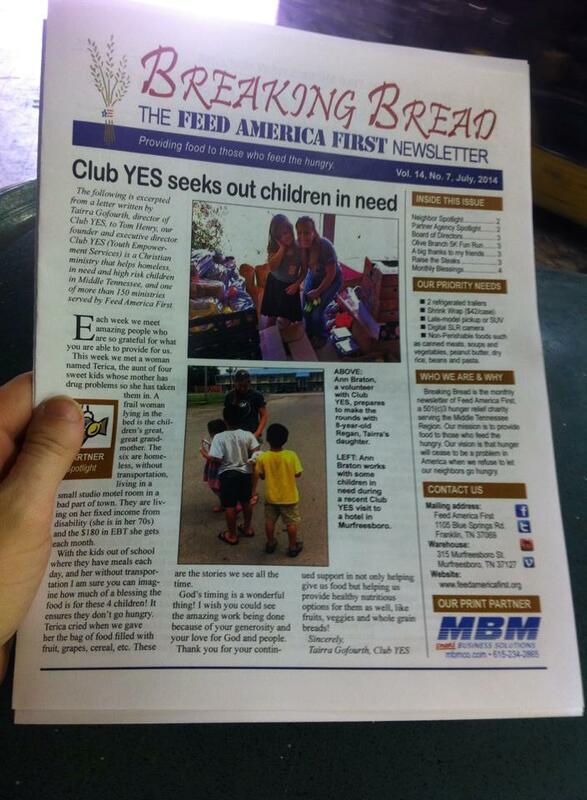 Club YES is a mobile Christian ministry giving schools, counselors, shelters, churches and individuals resources to help these kids that often fall through the cracks. We learned that even with so many resources here there are hundreds of kids going hungry, going without clothes or shoes that fit or even a bed to sleep on! Why? Well most resources require the parents seek out the help or they require personal information. Thats where we fit in. We fill the gaps for the kids and we find the kids forgotten to let them know that they are loved by God and their community. Schools and organizations can contact us with needs and if we are able to, we will fill those needs with no personal information needed. We hear from teachers constantly with students who smell from lack of hygiene care or their shoes are duck taped on to their feet or are going hungry on weekends and school breaks when there are no regular meals being provided. Thanks to our 24 hour supply closet and our relationship with Feed America First and our amazing volunteers we can deliver right to the school! Below is a list of current projects and services offered! We are a grass roots, community effort and we are 100% volunteer based meaning none of our board is on a payroll. Your donations are used to go towards helping these children eat, receive clothing and most importantly the gospel. We post lots of activity on Fabcebook so dont forget to like us! We teamed up with The Experience Community Church. They host breakfast in the park on Sunday Mornings for the homeless, many of them sleeping in our local woods. We host the Childrens Church area and are out there regardless of the weather, often needing to provide coats, blankets, hats, etc to keep these kids warm. At least every other Monday Night and often a few times a week we work with the kids at the emergency mobile shelter, Way of Hope. We provide field trips, play dates, bible studies, meals and more to help these kids who sleep on the floors of different churches each night. Sometimes there are situations where children may need a night or two in a safe place and we are able to open our homes to them even if its just a slumber party and a nice break from the shelter or motel. This is the time of year that started it all for us and we have a very fun and unique tradition! 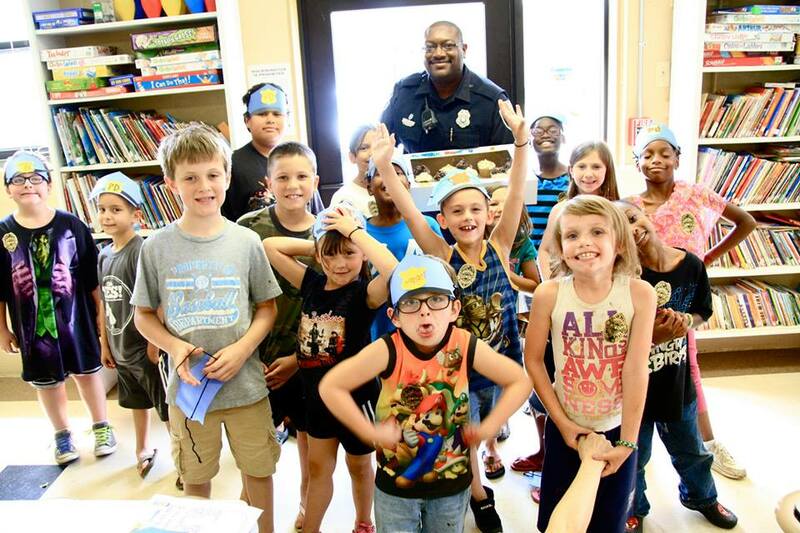 We host Operation Christmas Cheer and surprise the children who are without any presents. 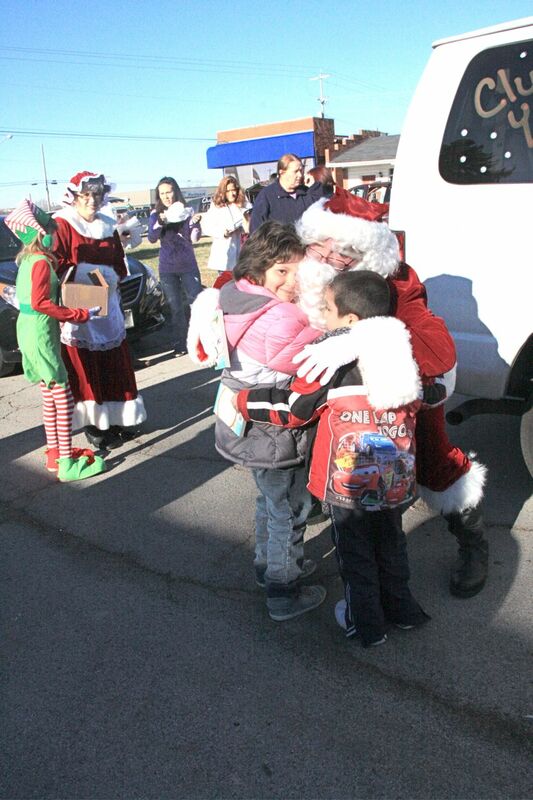 Santa and a caravan of 12 or more cars make their way around Middle Tennessee and visit the kids left behind to give them back the magic of Christmas! Can you imagine? Waking up to nothing and then…wait….whats that…….is that…it’s SANTA! On Christmas Morning! We will see hundreds of children who were not signed up for adoption programs and face dangerous situations on a daily basis. We hope to give them some joy in life again and hope through our Lord and Savior and help in any other ways needed. We keep clothing, shoes, toys, toiletries and food on hand 24/7 and it is available to any child in need with no paperwork or personal info needed. This service is often used by shelters, social workers and teachers. On the morning of 4th of July around the same time, groups all around Middle Tennessee will be “serving” every local fire station, EMS station, Paramedic, PD Department, Dispatch Office and Veterans Home that we can! What does it mean to “serve” them. We have adopted the term “You got served” as a way to literally serve them with delicious cupcakes and hand decorated cake boxes that express our love and gratitude for what they do for our communities. Please check out The Cupcake Crew or Club YES! Facebook pages for lots of picture examples! 2. The night before or morning of bake at least 2 dozen cupcakes/goodies per station you plan to visit. 3. To hold your beautiful cupcakes please purchase a white cake box and bottom insert. These can be found at hobby lobby, walmart, etc. 4. IMPORTANT! On the boxes please write “The Cupcake Crew” and “You Got Served” some where on the top of the box then use the rest of the space to wite words and messages of love and inspiration. Sign it too! let your kids draw pictures! 5. get your friends, small group or church group involved to make it a fun day for everyone! 6. dont be shy! We are pretty much expected now in Murfreesboro, but we like to wear our red white and blue, be fun and exciting! 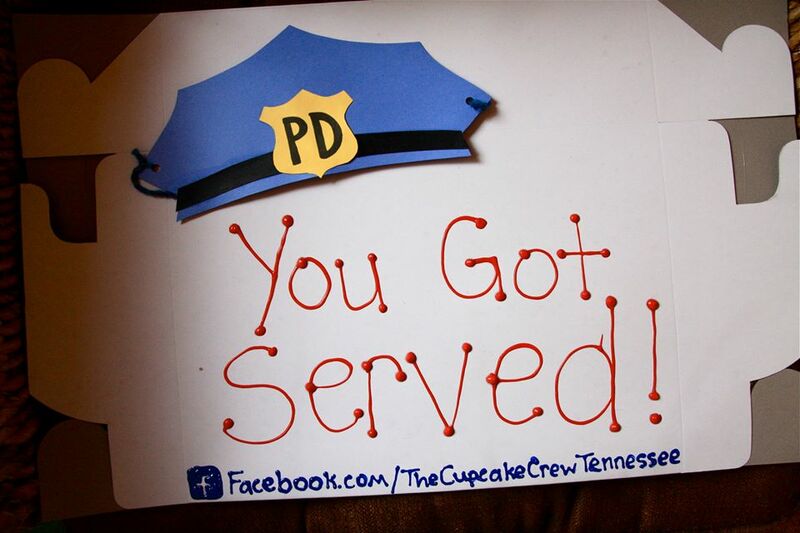 We like to tell them that they “Got Served” and we appreciate everything they do. Take pics! Give hugs! Have fun with it and be creative! 7. Dont say you can go to a location and then NOT do it. If something comes up please notify us right away so we can fill that spot. He lives under the bridge and is more giving then most…. My children and I were running some errands for Club YES and they were really hungry but I didn’t have any cash on me so I called a friend at a local soup kitchen. I like to go there and help the kitchen manager out and he provides us with bread and bakery goods to give to children in need. It was about to be lunch time there, so we thought we would come and help serve and my kids could eat afterward. At first the kids were a little nervous playing waiter and waitress but they quickly started to really enjoy serving everyone their meal of spaghetti and meatballs, green beans, garlic bread and chocolate chip cookies. while my daughter Regan was serving one gentleman his lunch he tried to tip her a five dollar bill. She tried to decline politely but he refused to take no for an answer and ended up tossing the money towards her since she would not come take it from him. She graciously picked it up and went over to him, shook his hand and said “thank you”. He told her that she was doing a very good thing serving everyone their meal today and he wanted to do something to give back too. After the children served the meals we went in a small connected room and waited for everyone to finish. We were soon joined by a sweet woman who is 67 years old and has suffered two brain hemorrhages. I know this because she reminds me every time we see her. She was telling the children that she had a horrible singing voice before the brain hemorrhages but afterward she could sing like an Angel. Then she started to sing praises to God. It was so cute and I chuckled to myself because you could hear the joy she received from singing praises to God. Of course it was not the angelic voice she may think she has but maybe it wasn’t the quality of her voice she was referring too, maybe it was the attitude in which she sang it that was Angelic. As we were sitting and listening to her sing that gentleman, David came and sat with us. We thanked him one more time for his generous tip. He was very hard of hearing and mumbled when he spoke. I think he was somewhere between 50 and 60 years old but the sun and so much time outside has aged him and it was hard for me to tell how old he was. Because of his hearing loss he often though we were saying things different then what was actually said and we would have to repeat ourselves. He thought he heard our sweet “angel voiced” friend say that she was broke. She did not say that, but he blurted out “your broke?, oh hunny, let me help you”. Here is a man who is homeless, gave $5 to my daughter for serving him a meal that we were so happy to give him and now he is pulling out every little scrap piece of paper from his pockets to find his very last $5 bill. He handed that woman his last $5 and she held it in her hands and began to weep. Her face crinkled up and her singing stopped and with so many “thank yous” she sat there and cried. I didn’t know what to do but hug her so I put my arms around her, then my 3 year old followed, my 8 year old and then my 11 year old son said “I need a hug too” and gave her a big hug which made her cry even more. It was so touching and sad at the same time to see him give away every last little bit he had to people who were “more fortunate” then him. She soon left to go to her apartment and it was time for my children to get their lunch. David followed us into the dining room and sat at the table next to us. We started talking and I found out that he has been living under a bridge for the past two years. I was instantly nervous for him because just 3 days prior a homeless man was beat to death in that same area. As we sat there he opened up his back pack which had his whole life inside it. He pulled out a camp pack which is basically a large zip lock bag filled with things you could easily eat if you were living on the streets or camping. This was supposed to be the food to help him survive. He pulled out a pack of crackers and a small bag of cheese its and gave them to my youngest daughter. Once again we tried to not take it but he refused to take it back and really wanted her to keep it. Once again it was so touching and sad at the same time. The kitchen manager gave my children a box of fruit snacks and they were so thrilled to open it and share it with David. At first he didn’t want to take it but once he saw hat it was a pack of fruit snacks his face lit up and he said “this is the good stuff!”. When my children saw that he liked fruit snacks they quickly grabbed a hand full and made sure David kept them. My kids finished lunch and we cleaned up and said goodbye to David. My kids were so touched by him and my oldest being eleven and having a little more understanding was very concerned for that sweet man. I asked them if they would like to give him a present. I noticed his backpack was very worn and starting to tear so once home we grabbed a backpack from our supply closet and packed two shirts, a notepad of paper, some pencils and pencil sharpener, soap, shampoo and a pack of razors. My daughter drew a picture of a kitten on a white paper lunch bag. Inside the bag she put a couple snacks and $7, then she tucked the bag inside one of the zipped up pockets for him to find later. She also wanted to pack him a small stuffed animal and of course, she stuffed one of the pockets full of fruit snacks. David has the back pack now and he said he found a job. I haven’t seen him since but we think about him every day. I can’t begin to describe the feeling you get to see someone give literally everything to others who had more then him to begin with. He took so much joy in being able to give. What a lesson we could all learn from Mr. David. It’s hard to think of children going hungry here in Middle Tennessee, especially when we have programs like the Rutherford Summer Feeding program where any child 18 or under can go to a local school and get a free meal. But let me give you a little insight into the BIG picture and why too many children are forgotten. The children who are in the most need of programs like the Rutherford Summer Feeding Program cannot make it there. All too often we see many different circumstances that prevent children from getting to places that can feed them. We see all kinds of stories from families not having transportation to families are struggling with issues like drugs or alcohol and are not in the mind set of helping these children get to feeding programs. It breaks my heart to know that children are forgotten and going hungry during Summer Break which should be one of the most fun experiences of a child’s year. Together we can fill that gap! With the help of school counselors, social workers and our volunteers we find the children who face these issues. We then go shopping for them and deliver food to them each week to ensure they are full, happy and if there are any other needs we can help with those too! They do not need to get to another location. We can take it right to the child whether it is a motel room, campsite, car, etc. Along with the food we can give small toys, activities, prayer, on the spot children’s bible studies and most of all LOVE. This effort cannot happen if we do not have the support of our community! 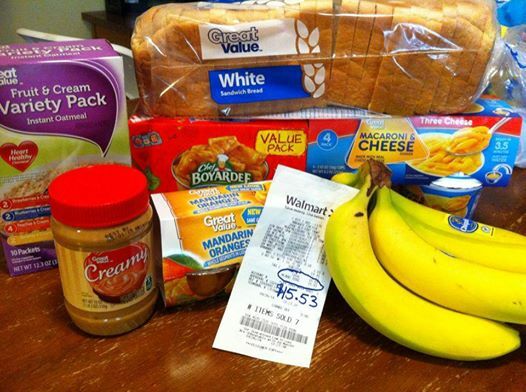 I went shopping today and for a little less then $16 I was able to get a modest amount that would feed a child for a week. We will need quite a bit to feed these children for Summer break which starts May 22. Please help our efforts and make a donation or simply share this information with your friends! Click on the donate link on our website or you can contact Tairra at 615-796-8001 and send a check payable to Club YES. Baby Jeremiah-homeless on his birthday – updated! Today was a special day for many moms all over the world just like it was for me in 2003, 2006 and 2011. 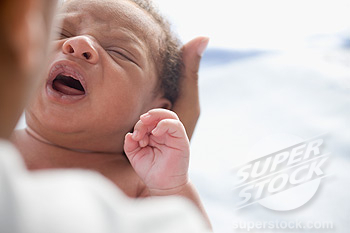 New moms are exhausted and joyful as they welcome their new child into the world. Today was such a day for a first time mother. I had never met her till I walked into her hospital room only to interrupt her breast feeding her first son for the second time. Even though I was a stranger she welcomed me into her room with the biggest smile as she held her new son like a pro! I remember with my first child I felt like I had no clue! As we were waiting for our mutual friend to arrive we talked about the baby and she asked if I would like to hold baby Jeremiah. I was thrilled! Of course I said YES! He was perfect! Silky light brown skin, dark blue eyes and a head full of thick dark hair. You could tell his eyes wanted to stay shut but he struggled to open them and get a glimpse of everything around him. His mother was so brave! Her first child and she did everything natural and didn’t complain. I told her how brave she was and calmly said, “well God was with me the whole time”. 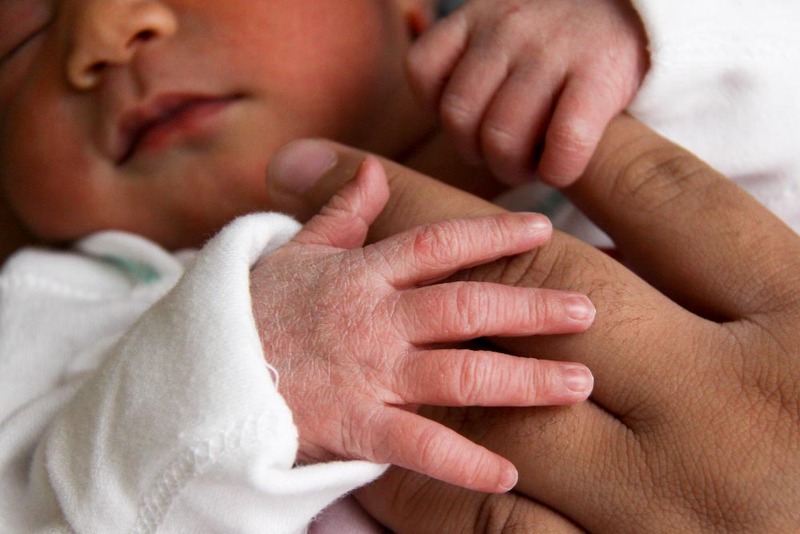 Why would I be barging in on strangers breastfeeding right after birth you may wonder? And why would they be so happy that I did? Jeremiah and his mother are currently homeless. They were staying at a local shelter but are now sharing a very small motel room with another homeless family that already has three children. After meeting Jeremiah and his mother I realized something. It doesn’t take a mansion or even a “normal” home to be a good mother and have a happy family. It takes love and strong faith. Both of which I can tell this young woman has. I’m sure this is not the situation her or anyone would want to raise a child in but I know this young man is blessed with a wonderful mother no matter where they stay. I pray for this new family and every new mother blessed with a child. Some children are blessed with homes with many rooms filled with things and yet their heart is still empty. You can not always measure someones life by what you see on the outside. No one should be homeless, especially a child but everyone deserves a wonderful parent just like we all have in our Heavenly Father! Happy birthday baby Jeremiah and congratulations to a wonderful new mother! As you tuck your children into bed tonight I want you to think about how your life or decisions may have been different if you were facing homelessness while giving birth. Many new moms face this everyday and it seems to only be on the rise. Homelessness is the face of our mothers and our babies. Not just the panhandlers on the corner that you try to avoid eye contact with as you drive by. It could happen to anyone regardless of race, gender, age or background. Homelessness knows no boundaries and still I was so naive to it just a few years ago. As I sat there holding baby Jeremiah I remembered my babies. Its hard to remember them being that young again but as soon as I held him all my memories of being in that same hospital came flooding back. The only difference was, I knew that when I was released I was going to my home and putting my baby in her nursery. This mother is so much braver then I am. She has strength most of us don’t get to test and I hope we can all keep them and every mother facing some of the hardest times during what should be the happiest moments in our prayers. Good night sweet Jeremiah, sleep well and welcome to the world. We hope it treats you kind and that you use your new life to walk with God always and bless others through the experiences God has already brought to you. Happy Birthday. 3/12/14 UPDATE!!! We are pleased to say that this precious boy is now 2 months old and I got the pleasure to cuddle him and rock him to sleep yesterday! His mother moved back in with her father but unfortunately not all home environments are healthy. Remember the family I mentioned she was staying with at a local hotel? Well they recently were able to get into their own home and they opened up their doors to this wonderful mom and her baby so now these two families continue to be each others support and they are now one big happy family! Baby Jeremiah is doing great and growing like a weed! He is just the cutest thing you have ever seen and we are so happy that him and his mother are safe and have the love and support of some great friends! Thank you to everyone who has been asking about them and wanting to donate clothing to Jeremiah! It is greatly appreciated and it warms my heart to see a community pull together to help a stranger when sometimes their own family are unable to do so. We are all brothers and sisters in Christ and with all the bad in the world today I am glad that when it comes down to it, we can take the opportunity to show Christ’s love to others and stand for what is the right thing to do!